Home > Books > Do You Know Colors? Illus. in full color. 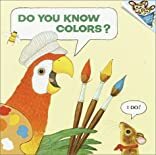 A parrot with a palette flies through this book, introducing colors and explaining how they can be mixed to form new ones.The flora and fauna are labeled by name as well as color.